I was decluttering the other day and stumbled upon this instruction sheet. I almost threw it away without reading it; but then the “Safeguard” caught my eye. I mean, I feel bad for those pet birds for sure. But what about humans? Wouldn’t the fumes cause harm to us? …the list could really go on and on. What about things that could hurt those animals? Does no one care about them? Maybe all manuals and instruction sheets should say “Hazardous to children and pets.” Then they’d have their bases covered. That seriously is the funniest thing I have read!! Overheated teflon creates fumes that do kill birds. For some reason, birds are more sensitive to these fumes than other creatures that may be in our homes. Some people are concerned about the effect on humans and believe it can cause flu-like symptoms, but as far as I know, there is no conclusive data on whether or not it is a risk. 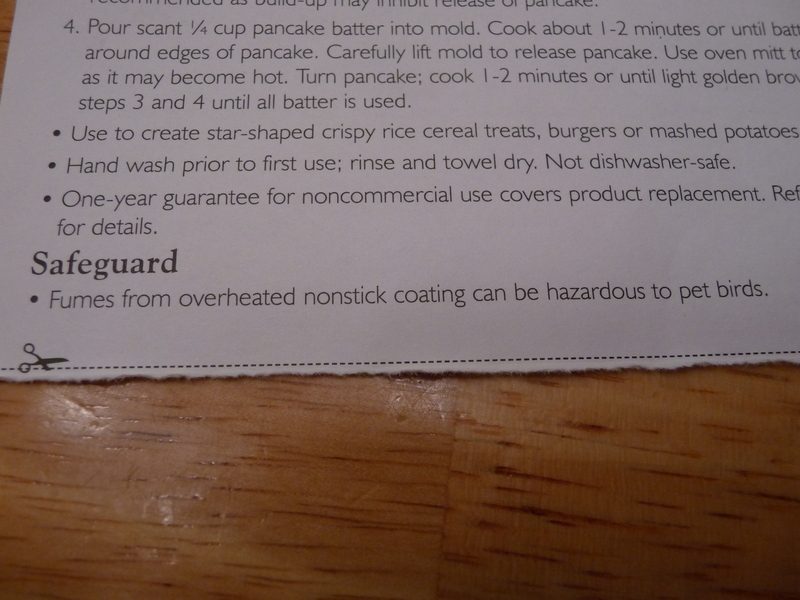 Personally, I choose not to use teflon coated pans. I figure if the fumes kill birds, I’d rather not have my family exposed to them. So….sounds funny but, amazingly, it’s true! Well, there you have it! Thanks for that info. I just thought that maybe someone sued someone else because their bird died & they wanted to blame it on something. So that’s why I thought it was funny. Plus, I’d never seen any kind of warning like that before. But I agree with you, if it hurts birds, why would I want my family exposed to that?